I used to sing for my DD before they should sleep and one of the songs was "Den største mand" (The biggest man) about a little Nisse who travelled around the world ... so here's the Nisse - drawn an d painted - and then added some stamps. 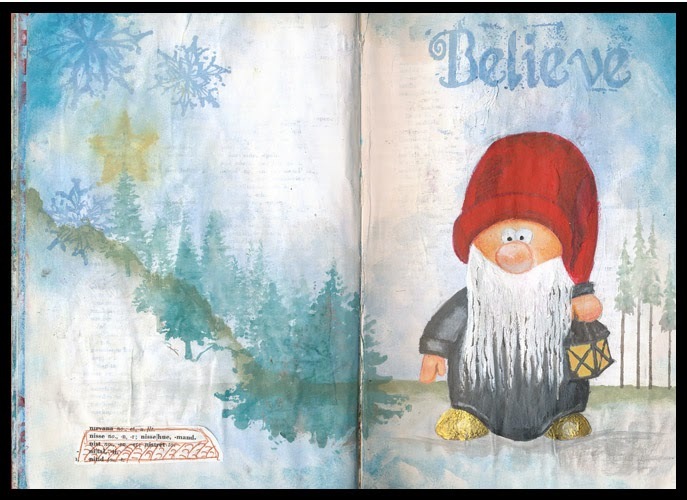 credit to http://goscandinavia.about.com/od/scandinavianculture/ss/denmarkculture_3.htm for the Nisse i painted. Love the scene you've created complete with snow and trees. Special credit for hand painting Nisse! Wonderful page, great drawing and scene created.